Art's Complex My studio is located at Arts Complex, and I like to participate in the group shows. 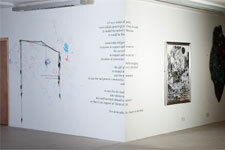 It was as part of a group show there that I first tried out the 'Call for a Constitution'. 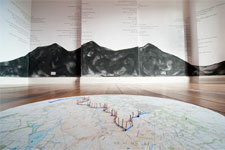 Axolotl-Gallery This installation is inspired by a walk in the Pentland Hills, from Hillend to Penicuik. It crosses six peaks: Caerketton, Allermuir and Castlelaw, before dropping down to cross the Glencorse river, and rising again over Turnhouse, Carnethy and Scaldlaw.